When I started sketching, there were two reasonable candidates if you wanted to use heavily sized watercolor paper and wanted to use watercolor over your pen sketches. You could use Platinum Carbon Black ink, a pigmented ink, and Noodler’s Lexington Gray, which relied upon bonding to cellulose for its water resistance. Lex Gray was only passable because it was a gray and when it smeared it didn’t create really bad smears. I used both of them – a lot. When DeAtramentis Document inks came to market, the stampede could be heard worldwide as we all rushed to our ink store to buy these waterproof inks. They’ve made a lot of us very happy, though these inks are a bit on the pricey side ($20/35ml). The story could end right there except that I’m like a bass in the weeds, lunging out at every shiny object trolled in front of my nose by the pen/ink manufacturers. When the Jet Pens newsletter featured Rohrer & Klingner Sketch Inks, my credit card warmed up, some buttons were pushed and I had three bottles of ink winging their way to chez moi. There are actually 10 different colors in this ink line. Each ink carries a female name and the bottle features a sketch of a woman. Maybe I’m supposed to know who these women are but I don’t. What I do know is that they are INK SKETCHES of women. Did I mention that the inks are called Sketch Inks? How cool is that? 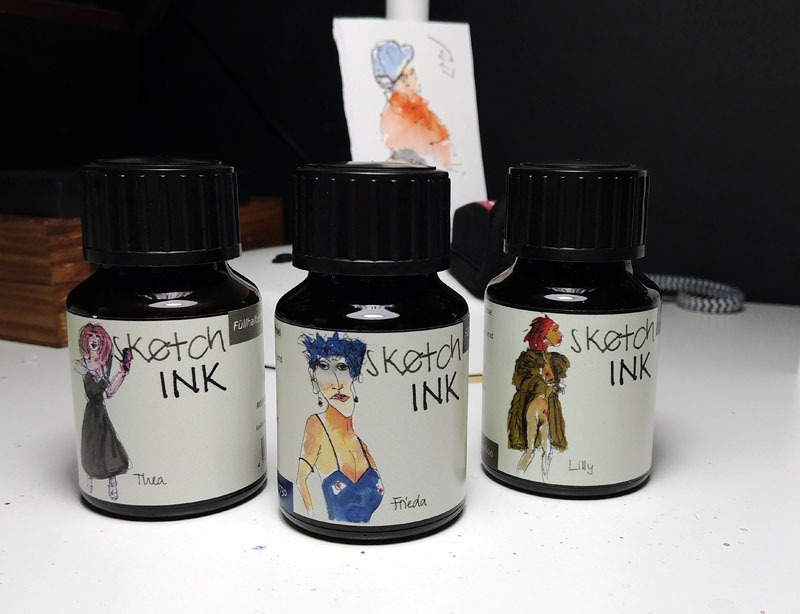 More important, these inks are nano-pigmented inks that are suitable for fountain pens and they’re a lot cheaper than the DeAtramentis inks I use. For $12 you get 50ml which works out to 24 cents/ml vs 57 cents/ml for DeAtramentis inks. And the sketches on the bottle are really nice. Did I mention that the inks are called Sketch Inks? Very cool. I bought bottles of Frieda (dark blue), Lily (dull brown), and Thea (dark grey). The dark grey is the most exciting to me because it’s a gray like Lexington Gray but absolutely waterproof even on Fabriano Artistico. The dull brown is very close to a color I’ve mixed using DeAtramentis Document Brown with a bit of black thrown in to neutralize it a bit. One thing that’s great about the colors I got, and I presume the rest of the line, is their matte quality. One thing I’ve never liked about Platinum Carbon Black is the shiny line quality. They should blend well with watercolor. Also, at least on the Emilio Braga paper I used for a quick test (below) these inks dry fast, really fast. (ed note: just tested on Fabriano and the ink didn’t smear after 5 seconds, maybe less). I haven’t had a lot of time with them (just arrived last night) but I stuffed Frieda into a Pilot Cavalier (fine), Lily into a Lamy Safari (Xfine) and Thea in to a Pilot Falcon (SFine). I scribbled a bit on photocopy paper and went to bed. 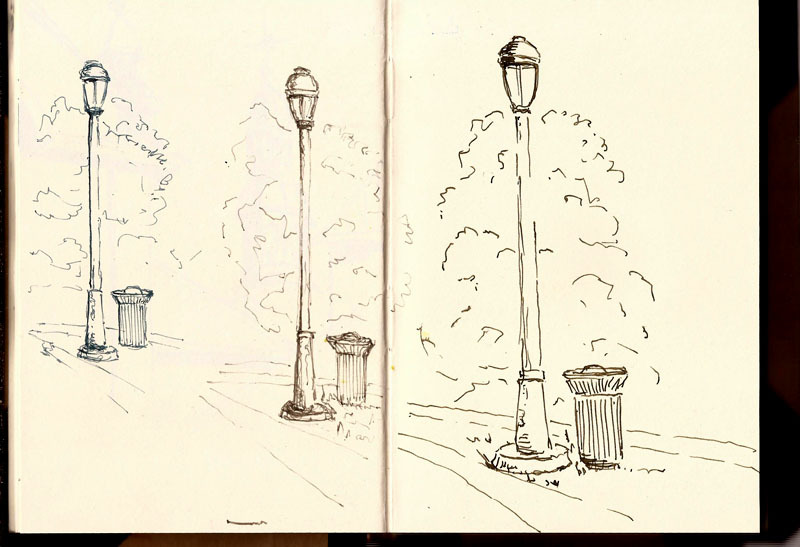 Figuring I needed something to show you beyond a picture of the bottles, I stopped while I was out and drew a lamp post and trashcan. I drew this same thing with each ink, spending a few seconds more than 5 minutes on this scribbly page. I apologize for them being different sizes; I didn’t plan as well as I might have. Ultimately, you’ll be seeing a lot of sketches from my use of these inks; particularly the grey and brown. I think I love my new lady friends. Left to right: Frieda, Lily, Thea, Emilio Braga 4×6 notebook. Most fountain pen inks are not lightfast because they are dye-based. These inks, however, are pigment-based and I haven’t seen any problems in that regard, but I generally work with blacks and browns. I believe there are 8 DeAtramentis Document inks. These Rohrer & Klingner inks just give us even more choices. In this case I think you will be pleased, at least that’s what I see so far with these inks. Great post, Larry. I like your sense of humor! I’m an ink smearer, so I’ve had to mostly forgo fountain pens. Might have to give these a go. I think you are officially an art supply influencer. “Art supply influencer?” That sounds dangerous. I’ll try to be more careful. As for being an ink smearer, it seems there are two kinds. There are those (typically left-handed overwriters) who move their hand over the lines as they are laid down. Then there are the type that move their hands over the paper and smear ink that is waiting to dry. I resemble the second type so I sympathize. It makes using Noodlers inks almost impossible for me. I tried a couple things to compare a Micron 03 to the Thea ink in a Pilot Falcon. I was doing these tests on Fabriano Artistico paper, a slower drying surface. Test 1: I drew lines, dragging a finger right behind the pen. The amount of smearing I got from both pens was slight but this would certainly be annoying. The important thing here, though is that the amount of smearing was very similar. Test 2: I drew some lines and waited 3-4 seconds before attempting a smear. Neither ink smeared. Then I drew lines with Thea, stopping at the end of each line so that the typical fountain pen ink blob formed. Because I was using a fine Pilot nib, that blog wasn’t large but it could be seen as a slightly darker tone. I did the smear test again after 3 sec and got mixed results. Sometimes that end point smeared slightly; sometimes it did not.